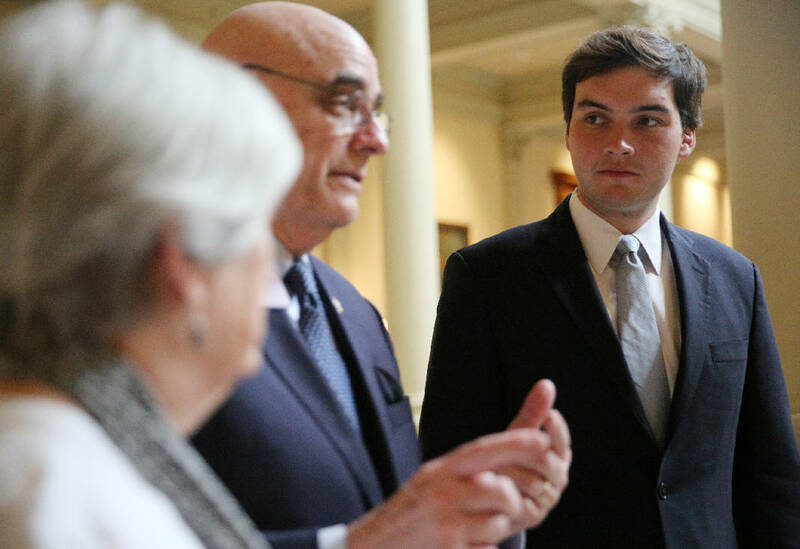 This story was updated April 10, 2018, at 11:20 p.m.
ATLANTA — Colton Moore speaks the language of the southern politician. He refers to his own generation as "the young folks," our current era as "this day and age." He calls a politician "a gentleman" and a gathering of politicians "a meeting among gentlemen." He makes observations such as "The Appalachian is a special breed. They're rugged, independent." And his voice: It's deep and smooth, like an old radio announcer's. It travels through halls and takes command of conversations. This isn't an accident. Moore thinks hard about how to use this voice. He considers how to best approach powerful people, how to greet them and hold casual conversations. He stands straight, all 6 feet, 4 inches of him. He looks them in the eye and encourages them to keep talking. He gives signals that they're saying is important and interesting. "Yeaaah," he says with that deep voice. "Surree," he says. All of which is to say, Moore always appears in control, even when logic says he shouldn't be. Take March 28, the day before Sine Die, the closing of the Georgia state legislature's 2018 session. Moore met in the Capitol with John Deffenbaugh, 73, who represents Dade and Walker counties in the House. On May 22, the two will face each other in the Republican primary for Deffenbaugh's seat. No Democrat is running. The day Moore arrived, the legislature was out of session. So with the room empty, Deffenbaugh brought him to the House floor. He shared a couple rules. Don't touch the desks. Don't touch the chairs. Don't smoke, despite the old ashtrays built into the desks. Don't walk down the middle aisle. "For some reason," Deffenbaugh said, his voice soft and slow, "that's a sacred thing for the members." He brought Moore to the well, the lectern in front of House Speaker David Ralston's seat, where representatives introduce bills. Moore remembered something Deffenbaugh said earlier, something about a book of rules that representatives follow. He wanted to read it. "Procedure rules?" Moore asked. "Is that close by?" "Yeah," Deffenbaugh said. "Yeah, it is—"
"Or," Moore said, with a sudden idea, "do you want to get a picture right here? I think, while we're standing here, this would be a great place for us to take a picture." "Can we get the seats in the background?" Moore asked an impromptu photographer. "This is the most common shot," Deffenbaugh responded, suggesting they stand in a different direction, one that would capture the speaker's rostrum. "Rules, ethics and decorum," he said. "All right," Moore said. "So everyone has a copy of this?" "Yes," Deffenbaugh said. "And that tells you how to present things, when you can do it, timing of doing it. Um. Someone put a, uh, amendment on a bill yesterday. And the guy who had the bill didn't like the amendment. So he questioned the timing of the bill. Or the amendment. As it turned out, it was like an hour off." "So was the objector successful?" Moore asked. "It was, uh, there was no amendment on the book," Deffenbaugh said. "So," Deffenbaugh began. He saw Rep. Bill Hitchens, R-Rincon. "Hey! Bill! Let me introduce you!" These are seats held, mostly, by older men. Some of them are middle-aged, with families and established careers as lawyers or small business owners. Others are retired or, in Deffenbaugh's case, semi-retired. The job is part-time. The state pays about $17,000 a year, plus a per diem for lodging and meals. Deffenbaugh said the pay isn't worth the work, if that's what you're after. It's especially difficult to justify in the early stages of your career. Deffenbaugh said the job is not all about writing bills. Speed and aggression don't always lead to results. You have to go along, get along, work with the same people every day. "The biggest thing you could ever accomplish is to be part of this family," he said. "And not everyone's accepted, by the way. You have to earn that right." "He was like the faculty," Gatlin said. "He was so mature." "Whether it be greed, whether it be extortion, the world is full of very, very dark avenues and dark people," he said. "I just want to be a light of good. Oftentimes, you cross bad actors. I just hope I am strong enough, mentally and physically, to stand toe to toe with these people." "This is Colton Moore," Deffenbaugh said in a cheery tone at a House luncheon. "And, uh, he's my opponent." Politicians and lobbyists laughed, drowning out Deffenbaugh's voice. State Rep. Al Williams, D-Midway, a 16-year veteran of the legislature, stood up and pointed. "You're going to get beat!" he shouted, though it wasn't clear whom he was shouting at. "Don't teach him everything," State Rep. Rick Williams, R-Milledgeville, told Deffenbaugh. "I've got underwear older than you," State Rep. Emory Dunahoo, R-Gainesville, told Moore. "You're his opponent?" State Rep. Johnnie Caldwell Jr., R-Thomaston, said. "That ... that's an anomaly." "All right ...," Gov. Nathan Deal said, before excusing himself for a meeting. Well, he's preparing his opponent to take his job. Moore can tell voters he's seen the legislature up close, gaining valuable experience. "I guess that could be," Deffenbaugh said. "My mental capacity is such that I do things sometimes without knowing some of the ramifications of it. But it's always worked out." "Why not find out who he is, what he's up to?" Deffenbaugh said. In his six years in office, Deffenbaugh has rarely grabbed a headline. His seat, assigned by Ralston, is in the back of the chamber. He's never given a dramatic, inspiring speech from the well. He doesn't like to publicly question the author of a bill during a session, preferring to talk to them quietly in the hall. Deffenbaugh is not an instinctual political animal, by his own admission. His speech is not smooth. Several times during Moore's visit, he referred to him by the wrong first name. He gets other people's first and last names mixed up. While telling a story about a former government worker, he asked his wife, "What was his name? He had that Hitler thing." "Pete," Linda Deffenbaugh said. "And don't tell them about that Hitler thing." "Don't tell them about that Hitler thing?" he asked. "OK."
The Deffenbaughs met at Covenant College, where John enrolled in 1966 after a stint in the Air Force. For the last 50 years, they've lived within a mile of the college. Deffenbaugh sold industrial electronics to companies with big buildings. When the legislature is out of session, he still works a couple days a week. His political career began in 1997 with the Dade County commission. He lost his re-election in 2000, then lost bids for the county executive seat in 2004 and 2008. He later became the county's Republican Party Chair. He decided to run for office again when former State Rep. Martin Scott stepped away. "I've always liked service," he said. "So why not?" There was once a 68-year-old lady who was having trouble getting a new driver's license. The woman was born in her home, Deffenbaugh said. She didn't have a birth certificate to show a Department of Driver Services employee. Deffenbaugh put her in touch with somebody who could work around the problem. There was another lady, he said, who called him, frustrated that she couldn't get her brother into a Veterans Affairs nursing home. The woman had reached out to the VA several times and got the run around. "I get answers quicker," he said. "There's no reason why that should be so. But it is. I've been able to help a lot of people, just with minor things." At 10:30 a.m. on March 29, the last day of the legislature, Moore sat in the gallery of the House, waiting for a session to start. It was supposed to begin at 10. But Ralston was not at his seat. Representatives shook hands, slapped backs, laughed at each other's jokes. It was entirely possible they were discussing pending legislation; it was possible that Moore was too far away to hear the details of their important conversations. "I'm not impressed," he said. "He's just lollygagging," Moore said. "Having a good time. And my impression is, every time I read the news, that everything is so hectic and so busy on Sine Die. This is the last day to get business done. And here we are, starting this thing 30 minutes late. And we're playing tiddlywinks, you know? It's frustrating." He continued, "Obviously, this is not punctual. They're just now starting to pass out different papers. Where is the speaker? Where's David Ralston? He needs to come down and call his house to order." "They've had 40 days to exchange pleasantries with each other," he said. "Is it a social club?" Above all, Moore appreciates the value of hard work. He doesn't listen to music. He can't remember the last TV show he watched. He doesn't go to the movies. He doesn't like sports. He doesn't read, save for an academic article before bed. He doesn't have a girlfriend, though he hopes to one day meet the right woman — "someone who's just as passionate as I am." Before bed, he wonders if he let any time slip away. "I have a lot of things I want to do in life," he said. "I don't know how long I have to live. Every minute of the day, if I'm not working toward getting those things accomplished, then it's a waste of life." He gets this ethic from his father. Walter Moore is the Appalachian man, the special breed who is rugged and independent. He is a hillbilly, Moore said, "as country as cornbread." There, Moore became infatuated with the auctioneers. They were at the center of the show, talking rapidly, holding people's attention, moving product. At 7 years old, he began practicing his own auctioneer chants. His junior year, out of 20,000 students, delegates elected him vice president of the Georgia chapter of FBLA. He traveled throughout the state, helping train other students for leadership roles. He organized workshops at conferences. Gatlin worried Moore worked too much. The next year, he told her he wanted to be the organization's president. "His ambition, what he exhibits," she said, "it's so powerful." He learned how to create a sense of calm with his cadence at the beginning of a sale, using longer filler words between bids: "Are-you-able-to-buy? Are-you-able-to-buy? Are-you-able-to-buy?" He learned how to create urgency toward the end of a sale, ratcheting his speech from 80 beats per minute to 120, trying to drive up the price in the final moments: "And-take-and-take-and-take-and-take." His voice grew strong. He usually works a week or two overseas, then returns to Dade County for about a month. While home, he still works for his father, hauling cattle and clearing land. He proudly calls himself a workaholic. He doesn't worry whether he's toiling away in his youth. "If I'm tired or lonely or worried," he said, "I'm not working hard enough. When I think, 'Oh, I'm just depressed.' Well, I probably need to take my mind off that with some work." It's just, Gargiulo said, Moore is motivated. He wants to change things, make it so certain bad things won't happen to other people. "His family members went through ... " Gargiulo started. He paused. "Different situations." Moore sat in a booth at the Metro Cafe Diner in Atlanta, one of those restaurants with a collection of big cakes waiting behind glass. It's a special place for him. When they were in FBLA, he and Gargiulo ate here after conferences around the block, sometimes talking past Midnight. He considered his campaign. He hadn't raised any money yet, and he knows he's young. But he's optimistic. He understands Dade County; his father's family has lived on Lookout Mountain since just after the Civil War. He's ready to grind through the next couple months, knocking on doors and speaking to civic groups. "That," he said, "was quite the turning point in my life." "It's given me all my drive," he said. "Going forward in politics, it's something that I really want to change," he said. "That issue being said, there's 100 other issues. There's thousands of other issues that people are just as passionate about." But if there's something motivating you to run for office, don't you want voters to know? Don't you want people to understand where you're coming from? Moore took a breath: "It's criminal justice reform." What happened was, in November 1996, a confidential source told the Lookout Mountain Judicial Circuit Drug Task Force commander to check Walter Moore's business. Investigators entered at night. In a storage room, a drug dog stopped at a box. Inside, wrapped tightly in plastic, they said they found seven packages of marijuana. It weighed about 20 pounds. Moore was 3 at the time. His father's trucking company was done. Moore and his mother, Angie, moved out of their home in East Ridge to Trenton's Edgewood Townhouses, which provided housing to low-income families. Angie took a job on the line at Cooper's Hosiery Mill in Fort Payne, Ala. They spent their money on lawyers. Before the sentencing hearing, Walter's friend picked Moore up and drove him to court. He told Moore this might be the last time he saw his father in a while. Moore brought a drawing of two giraffes, a father and son. In the years that followed, the family struggled. Walter's probation kept him in Trenton. He couldn't work in trucking and took at a job at a local lumber mill instead. Creditors sued the family for $20,000. Moore said Walter has maintained he was innocent. Asked about this time in their lives, Angie wrote in an email, "Bad things can happen to good people." "The friends I had there in the apartment complex," Moore said, "many of those individuals have been in and out of the criminal justice system. We were both there." "I often think, had my father went on to prison, would I be just like all those other individuals that I was with there in the apartments? Would I be in and out of the criminal justice system?" "Would I have had the opportunity to succeed at life? So yeah, I mean, that — that — that's quite, quite ... "
"I was quite blessed to have the father I had." "I think maybe, maybe, when all that situation happened, he realized he had to do the best job of raising me as he could. You know? I'm proud of him for what he's done in my life ... I remember telling my mom, 'Whatever it takes. How do we get dad back? How do we get dad back?' She didn't have an answer." "There's big, big things to be done in criminal justice reform," he said. "Big things. There's a lot of innocent people. There's a lot of innocent people that get turned around in the criminal justice system today." Public defenders' case loads are too big, he said. He believes too often, prosecutors threaten defendants with long prison sentences. Too often, the defendants are scared and take a lower plea agreement. "They become convicted felons, many times," he said. "They can't go out and get a job, you know? They mess up their entire lives." "If I get elected," Moore said, "I tell you, one of the probably first things I'll do: I'll be flying out to Texas to meet with that group and figuring out how they operate." Around 6:30 p.m. on March 29, the final hours of the legislative session, Moore walked downstairs from the gallery, to the door of House. A couple of lobbyists sat on a bench together, one man's arm slung over another's. "You are the impeccable southern gentleman," someone inside the chamber said. A group stood in a circle, all wearing the same pins — "Vote No on SB 363" and "Vote No on SB 452." Another group huddled around a TV, showing the action inside the House as lawmakers voted through a conveyor belt of bills. They jotted notes on yellow legal pads, typed text messages. A TV reporter stood in front of a camera, reading notes. "I'll just walk," she told a cameraman, practicing gesturing her arms before her live spot. "I want to emphasize this point," he said. "Please be back in your seats by 7:20."